We are constantly adding to our collection as well as periodically having special promotions. 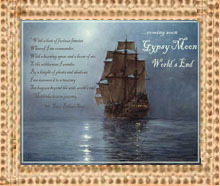 Please bookmark this page to stay up to date on Gypsy Moon News. Also, make sure to Sign Up for our Newsletter to find out what's happening at the Moon! Gypsy Moon Home ... Designer and textile artist Christine Karhi brings us her luxurious home goods using the fabric and feel you love about our clothing. 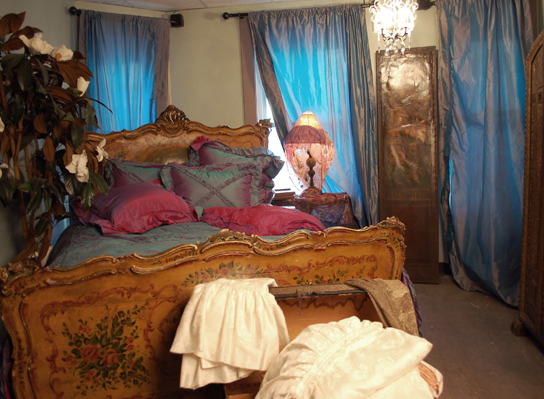 Evocative and soft, why not dress your home in the most romantic silks in the world? 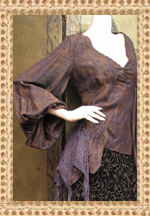 Spring '09, Gypsy Moon's Dark Tribe ... our most mysterious collection, ever! Also watch for lots of new designers: The romance of Bonnie Strauss with her velvet jackets and vintage inspired silks ... the Boho charm of Robin Kaplan ... the cool chic of Gary Graham and Hazel Brown ... the most modern and beautiful leather jackets, luxury bags and clothing from Mike and Chris, the delicacy of Grai and the avant-garde look of Mo Koshji. COMING SOON: Froud FaerieWear by Gypsy Moon! I have often been asked if I would ever consider making “people sized” clothes inspired by my dolls. The idea of creating a line of clothing inspired by Froud ideas and designs has always been appealing but something that I never felt I had the experience or expertise to acheive by myself. When Candace Savage of Gypsy Moon and I met, we knew that the combining of our talents could create a line of clothing that would be fun streetwear with a touch of magic; beautiful and above all wearable, not just by slim, young faeries but by faery godmothers like me! Gypsy Moon clothing has been known and loved by women for years and Candace’s sense of fabric and design perfectly compliments my own. 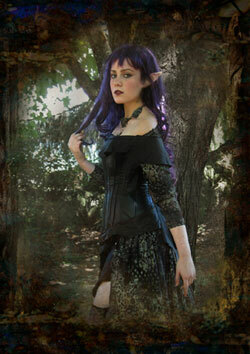 Together we are designing a line of afordable, comfortable FaeryWear for faeries and faery godmothers everywhere! And watch the video preview! Soon there will be a fresh, cool feel to the air and the landscape will begin to change colors ... at the same time, we will all begin craving things like the hottest boots, sweaters and cozy jackets that don't look like what everyone else is wearing. Stay tuned to Gypsy Moon and sign up for our newsletter to get the freshest new looks from Rozae Nichols, Chan Luu, Inhabit, Morphine Generation and many others ... and, of course, the latest in romance from Gypsy Moon! For the first time, Gypsy Moon is introducing a collection of the best designer lines we could find. We have chosen carefully and kept in mind what we would like to own, how these lines fit into our lifestyles, how difficult it is to find these designers, online. Our World's End collection is Here! In addition to our exciting batch of new designers, we are offering a small collection of pirate-inspired streetwear with a guest appearance by our handsome pirate, John. Be sure to watch him in action on Pirate Master, Thursday May 31 on CBS! Hot News from the Moon! Coming soon ... Gypsy Moon will be introducing a line of romantic accessories for the home. You will soon be able to dress your bedroom, your living room and your walls with hand-made pieces that have the same style and luxury fabrics as our clothes. Hand-loomed curtains, reversible velvet comforters and so much more to add a softly aged and elegant look that we think will be absolutely unique. Let us know what you think! We are bringing back the pirates with an historical love story written by our talented-as-he-is-handsome pirate model, John. The Journal of John Rasmus will also appear in chapters in every issue of the new Pirates Magazine, with lots of illustrations and tons of adventure ... you won't want to miss this. John Rasmus will make Johnny Depp look like a ... well ... like an actor! Also, keep yer eyes peeled, maties ... we are introducing an entire of line of pirate-inspired streetwear and accessories. As my husband said when he saw our new silk scarf printed with antique skulls and lots more, “Steve McQueen, eat your heart out!” Oh well, Steve, Alexander ... whatever ... the line is fun and wearable and we're very excited about it. Visit our Sale Rack — Gypsy Moon‘s Treasure Hunt ... You never know what wonderful things you‘ll find here ... one-of-a-kind items, vintage gowns, past collections, pieces used for photo-shoots and more! About our Sale Rack: As most of you know from our newsletters, Gypsy Moon is adding some beautiful new lines as of Spring '07, and the last of our previous collections are now appearing on our Sale Rack. Get ready for the most glorious silk skirts by Chan Luu in colors so radiant, you will think the sun is always shining on them. Also by Chan Luu, dainty silk clutch bags, exotic jewelry and so much more ... Rozae Nichols will also be gracing our racks with flattering layers and wide-legged trousers and all the feminine details we love. But there is much, much more than I can tell you here, inexpensive washed silk skirts, dresses, blouses and camis that can be mixed, matched and layered with each other or with Gypsy Moon pieces, unbelievable light and soft-as-cloud summer sweaters by Inhabit and Velvet, as well as Gypsy Moon, Italian silk dresses, even some nightgowns and lingerie and some surprises, too. Since everyone loves our Sales Rack, we will keep it as long as we can, maybe permanently. When the stock room is empty (nope, it isn't yet! ), and the boxes of bundles, yet to assemble, we still have many, many bolts of fabric and we will work though it until it is gone. By that time, we should have a pretty good idea of what everyone likes most, and that's what we will concentrate on doing. Our policy is to show our clothing on real people because real people will be wearing our clothes. For our summer update, in response to many of your emails asking us to show our clothing on regular women who are not model-sized. We have decided to use three young, non-models in three different size ranges, to show that beauty and grace aren't determined by a number, but rather by good spirit and good health. We welcome your feedback on this, we think our models are absolutely beautiful and so are you! We are always in search of customer models. If you would like to have a picture of yourself wearing one of our outfits featured in our Customer Album ... send us a note!. The Premiere Issue of Pirates Magazine is here!